The campuses of colleges and universities, particularly those outside a city’s limits, can be essentially small (or even medium-sized) cities in their own way. Berry College just outside of Rome, Georgia is the nation’s largest campus at 27,000 acres. The United States Air Force Academy in Colorado Springs comes in a close second at 18,000 acres. The typical school has dozens of buildings; numerous off-campus student housing options; and tens of thousands of people moving on and off campus, and between stops throughout. That’s why many institutions offer bus and shuttle services to provide transportation for students and staff — they face the same challenges of providing consistently high rider satisfaction levels that municipal transit authorities and operators do. This presents opportunities to experiment with adding new technologies and services to improve customer service and increase ridership. A study conducted at the University of North Dakota in 2011 asked college students what factors influenced their decision to ride the campus shuttle. The top reason they provided is convenience. Other reasons included time, accessibility and parking availability. However, whether students realize it or not, the most important service campus shuttles provide is safety. They are a convenient and reliable way for students to get around campus at night, particularly if they are alone. Another safety hazard faced by college students that shuttles can help with is bad backs. A study by a University of Indiana professor found that the average graduate student carries a backpack weighing just over 12 pounds. That’s a lot of weight to bear when you are hurrying across miles of campus. Adding more vehicles and stops alone to provide acceptable service levels is no longer adequate. 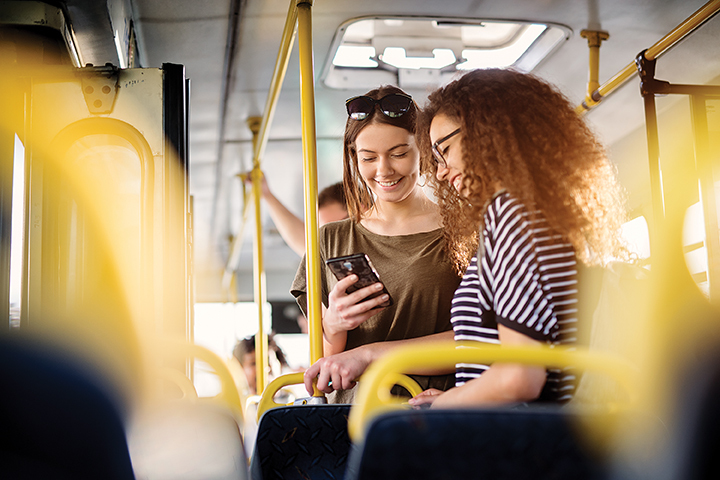 Increasing ridership numbers requires leveraging technologies that enable operators to evolve from being transportation providers that send buses and shuttles along predetermined routes to mobility management providers that consider all aspects of their riders’ journeys. That begins with the collection and analysis of information from multiple sources. Installing telematics technology in all vehicles should be a priority to facilitate the collection, analysis and use of data in real time to do much more than monitor whether a shuttle reaches a stop at the scheduled time. Factors like driver behavior, vehicle performance, rider demographics and even how the time of day affects ridership levels can be captured, too. Collecting this information can help implement some variation of after-hours and on-demand services, which can significantly boost ridership considering students frequently need access to reliable transportation in the evenings and on weekends, when regular service is often scarce. This can include providing riders with a mobile app to request a pickup and drop-off location — usually anywhere on campus or the surrounding area. The Massachusetts Institute of Technology offered a late-night on-demand shuttle service that operated after normal hours. Its service, SafeRide, operated as a fixed-route campus shuttle from 6 p.m. to 11 p.m. At 11 p.m., the service switched to an on-demand model. Riders used a mobile app to request a pickup and drop-off at any location within the SafeRide zone. The pilot program ran through the beginning of June. Princeton University, University of Connecticut and Brown University are just some of the others that offer similar transportation options. A few universities like the University of Michigan introduced self-driving, autonomous technology with Autonomous Vehicle Shuttles on their main campus. Similarly, at Baylor University in Waco, Texas, students and visitors can ride the Baylor University Shuttle (BUS) for free. The fixed route service not only provides transportation to classes and campus activities, it also helps reduce vehicular traffic and parking congestion on campus. In addition to its regular service on class days, there is also an after-hours BUS that runs from 6:30 p.m. to 1:30 a.m. Monday through Thursday. To make the after-hours service more convenient and predictable for students, Baylor has implemented a GPS tracking system on its buses. Students download Baylor’s app to their smart device and can track the BUS in real time. The shuttles do more than just transport students to class. Many will also take students to areas close to campus, so they can run errands or get to jobs and appointments. Shuttles are also important on game days when crowds of alumni converge on campus to cheer on their alma maters. The game-day shuttles often operate for hours before and after game time, transporting thousands of people safely to the game and back to their cars or campus. Take a lesson from the internet and store retail sector: it is impossible to overestimate the importance of always striving to create a better customer experience. That is critical to turning first-time or occasional customers into long-term, loyal brand advocates. The same philosophy applies to campus bus/shuttle riders. Build long-term loyalty, and you will not only maintain ridership levels, you’ll see them rise as happy riders broadcast their satisfaction across all their social media channels. That is why technology plays a key role not only in the “back room operations,” but also in improving the customer experience. You should strive to be the primary source of information that passengers turn to for all of their transportation options. Provide them with a single view into bus and shuttle arrival times and delays, as well as their options for the last mile, such as a bike- or scooter-sharing service. If you can make last mile services more accessible, that will have a positive impact on ridership trends. Consider this scenario: A rider’s bus is delayed, but she’s not in a hurry. She can check the app on her smartphone for nearby leisure options, like the Starbucks in the student union or just off campus. If she’s in a rush to get to class, she can view alternative means of transport such as a ride-sharing service or a bike share. That is how to create a direct connection to the individual passenger on a mass scale. Beyond implementing the necessary telematics and other technologies, improving passenger satisfaction and safety levels also requires taking a more holistic approach to public transportation. Embrace options you may view as competitors, such as ride-hailing services, and you build loyalty among your riders, even if your services are not options for them to traverse that last mile. Loyal riders become frequent riders and encourage their friends and family to do the same. The ideal shuttle service enables a student to roll out of bed and hop on the campus shuttle rather than trekking across campus on foot to make it to class on time or pick up a pizza at a nearby restaurant late at night. This combination of safety and convenience will be a big selling point to all those prospective students and their parents during a campus tour. If you operate a fixed route service near a university campus, reach out to students and faculty to understand how they transport their students — you might just uncover a new opportunity to deliver new services and boost ridership levels. Russ Tieskoetter is the chief operating officer of RATP Dev USA, a subsidiary of RATP Group, one of the world’s largest providers of public transit services.